But he did nothing, not really. There is some stuff in these executive orders that affect a small portion of gun orders that like NFA stuff, but Obama’s teary speech was to announce things that are already laws, and have been laws for decades. Now what is Everytown and Bloomberg and MSNBC going to say we need to do for the children? 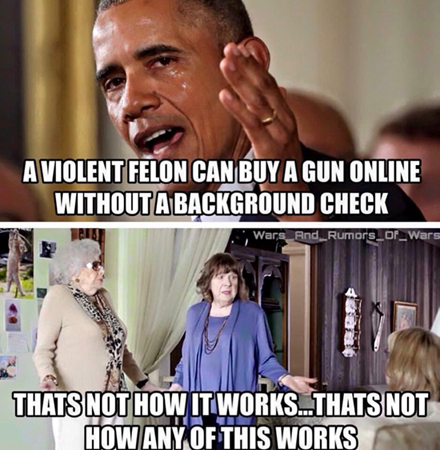 Now that they can't yell "close the gun show loophole!" anymore. Is Obama going to come on TV in a month to forbid the manufacture of new transferable machine guns? Is the ATF going to release new guidance that a rifle with a barrel shorter than 16” is an SBR? Is you're going to be an executive order declaring silencer’s subject to NFA regulation? Go ahead, ask yourself, now what are they gonna yell about?